Guide-it™ CRISPR Genome-Wide sgRNA Library System은 인간세포에서 CRISPR/Cas9 Genome Editing을 이용한 전체 유전자 표현형 스크리닝 (Genome-wide phenotypic knock-out screening)을 용이하게 할 수 있도록 제작된 제품이다. 본 제품은 Cas9과 sgRNA library를 안정적으로 발현하는 세포주를 쉽게 제작할 수 있도록 Lenti-X Single Shots 형태의 genome-wide sgRNA library와 Cas9 단백질 발현 시스템을 포함하고 있다. Genome-wide sgRNA library는 Brunello library (Doench et al. 2016; Doench, 2018)를 기반으로 하고 있으며, 유전자 하나 당, sgRNA 4개씩, 총 >76,000개의 sgRNA를 제공한다. 그러므로 총 19,000개의 유전자를 타겟팅하여 표현형 스크리닝을 진행할 수 있다. 스크리닝을 진행 후, Guide-it™ CRISPR Genome-Wide sgRNA Library NGS Analysis Kit (Code 632647)을 이용하면 next-generation sequencing 분석을 진행할 수 있다. Guide-it™ CRISPR Genome-Wide sgRNA Library NGS Analysis Kit (Code 632647) 제품 내에는 sgRNA library가 도입된 세포로부터 NGS library를 제작하기 위한 모든 프라이머와 시약이 포함되어있다. 본 제품의 sgRNA library는 sgRNA representation을 보장할 수 있도록 제작되었으며, 다카라바이오는 library 합성, 증폭, 바이러스 제작 및 타겟 세포 도입의 각 단계에서 모두 sgRNA representation을 측정 완료하였다. 본 제품은 동결건조된 Lentivirus 형태 (dry-down lentiviral format)의 validated sgRNA library와 Lenti-X 293T cell을 포함하고 있으며, 동결건조상태의 library mix에 물만 넣고 293T Cell에 첨가 및 배양하면 Lentiviral particle을 만들 수 있도록 제작되어 있다. 그림 1. Vector and sgRNA scaffold design Guide-it CRISPR sgRNA library. Panel A. pLVXS-EF1a-Cas9-PGK-Puro and pLVXS-sgRNA-mCherry-hyg vectors map. Panel B. sgRNA scaffold design. 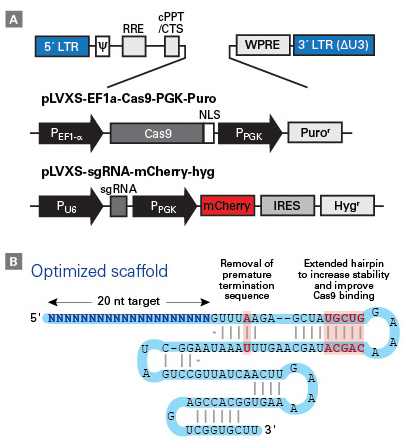 sgRNA는 Human U6 promoter로부터 발현되며 최적화된 scaffold 서열은 Cas9 loading을 용이하게 하여 genome editing 효율을 높여준다. 그림 3. Representation of sgRNAs within the Guide-it CRISPR Genome-Wide sgRNA Library System. Panel A. Guide representation in plasmid library. Panel B. 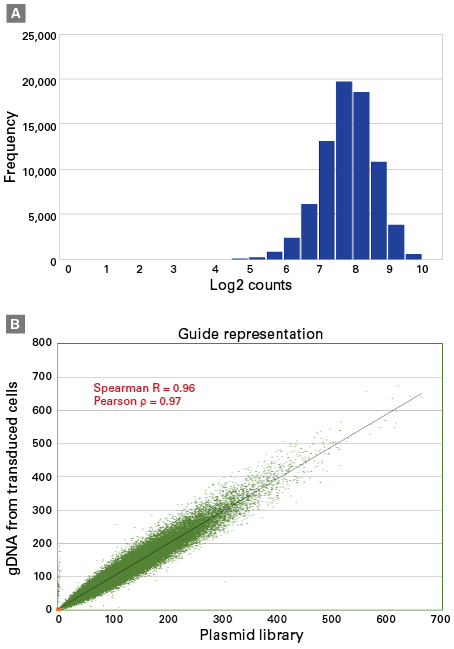 Comparison of guide representation in the plasmid library and transduced cells. 그림 4. 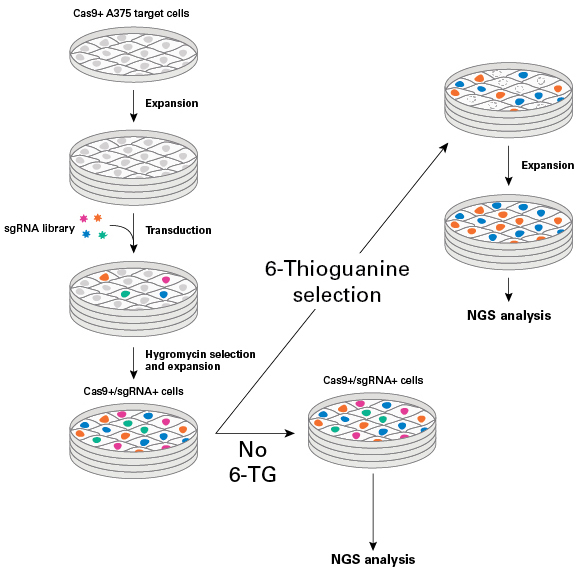 Identification and analysis of sgRNAs isolated from cells after a 6-thioguanine (6-TG) screen. Panel A. sgRNA representation was compared between the original plasmid library population used to make the lentivirus preparation and the resulting transduced, selected and non-selected cell populations. All four sgRNAs for HPRT (red dots) and NUDT5 (black dots) were enriched in the 6-TG-selected population (blue dots). The representation of these sgRNAs in the plasmid library (gray) and transduced, non-selected population (orange) is also shown. Panel B. After selection, the sgRNA representation was shifted in response (blue) to 6-TG. Individual sgRNAs that were enriched are highlighted within this correlation (red and orange dots). 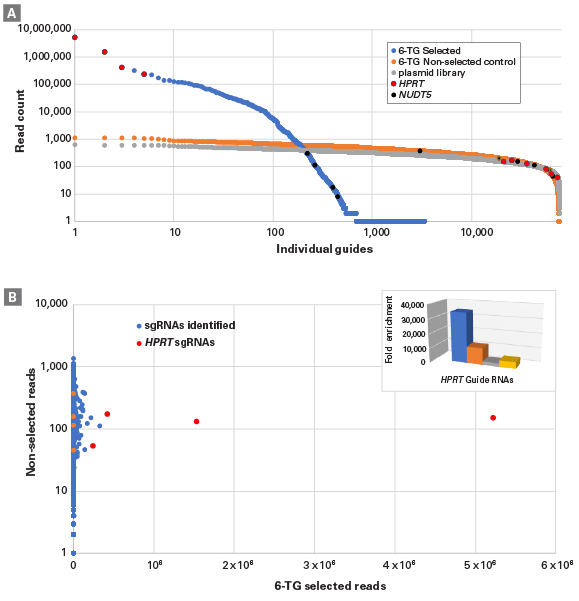 Inset shows fold-enrichment of the four sgRNAs for the HPRT gene as compared to the non-selected population. 그림 5. Workflow schematic for an sgRNA library screen using 6-thioguanine (6-TG) selection. Guide-it™ CRISPR Genome-Wide sgRNA Library NGS Analysis Kit (Code 632647) 제품은 Guide-it™ CRISPR Genome-Wide Library PCR Kit (Code 632651)외, genomic DNA 추출 및 PCR 산물 정제 키트가 포함되어있다. in vitro transcription에 의한 sgRNA 제작 및 효율..
CRISPR Knock-out을 이용한 19,000개 이상의 유전자..
Knock-in 실험을 위한 donor template 합성 (5kb ss..